COVENTRY City Council overspent by £460,000 on last year’s taxpayer-funded Godiva Festival – more than three times its budget for the event. The increasing size of the festival and the spiralling costs of staging it put extra pressure on the council’s budget, chiefs say. Conservative group leader Councillor Gary Ridley says decisions need to be made to control spending and keep the event free to attend. The event’s budget was around £150,000 but a further £460,000 was spent staging the festival last year, at a total cost of £610,000. The Godiva Festival, the UK’s biggest free festival, has grown from a relatively small event when it launched in 1997 to a nationally recognised three-day music show. Last August, stars such as Jake Bugg, Ronan Keating and Editors took to the stage in War Memorial Park. The council is looking to offset increasing costs in the future by boosting income from the event. It could introduce a parking charge at War Memorial Park and seek further sponsorship for the festival, as outlined in its latest budget report. Coun Ridley called for an urgent all-member council briefing to discuss the details of the overspend, which are not yet publicly available. He said: “The thriving Godiva festival has gone from strength to strength in recent years. People will want to know that this event remains viable and there for the future. He said there seemed to have been ‘a complete failure’ to control costs by the council. “As we approach our year as City of Culture, I believe passionately that it should remain a free event. “However, the council needs to come forward with a viable plan to tackle this overspend. “On the strength of what I have seen so far I’m not convinced they have. 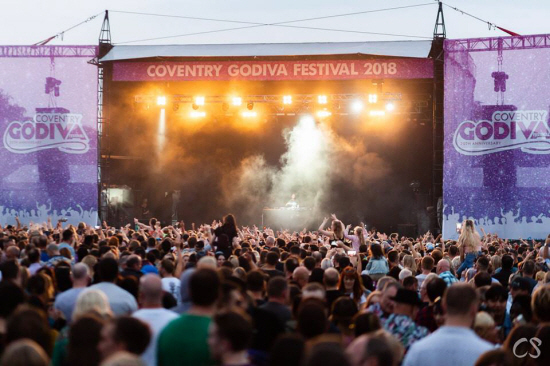 A Coventry council spokesperson said: “The Godiva Festival is regarded highly by local people and benefits everyone, and the council has already announced that the festival will take place again next year. “The council is committed to the event in the future. “The free family music festival is the biggest in the UK and independent evaluation shows that last year’s festival brought £2.3million into the economy with 20 per cent from non-Coventrians.